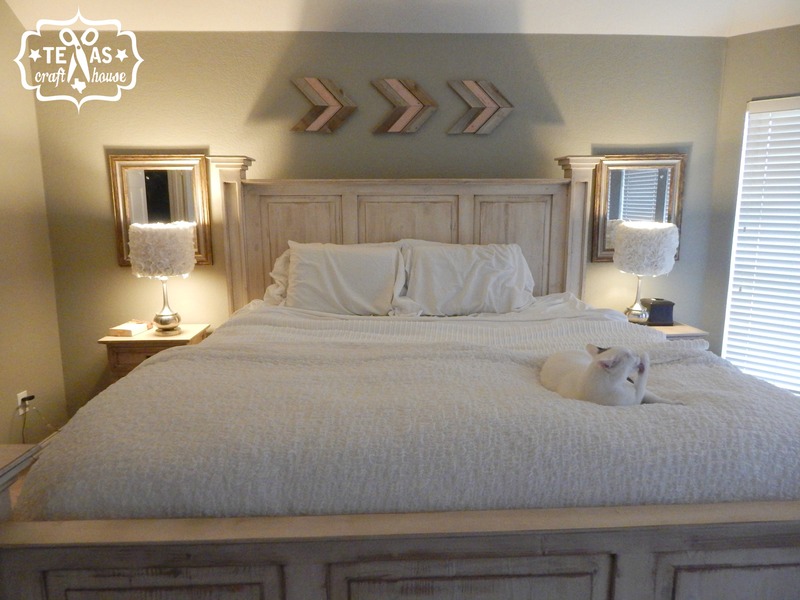 Here are a couple of before pictures of my master bedroom. The two lamps getting the makeovers are the ones on my night stands. They’re nice but I have had them for years and was ready for something new. 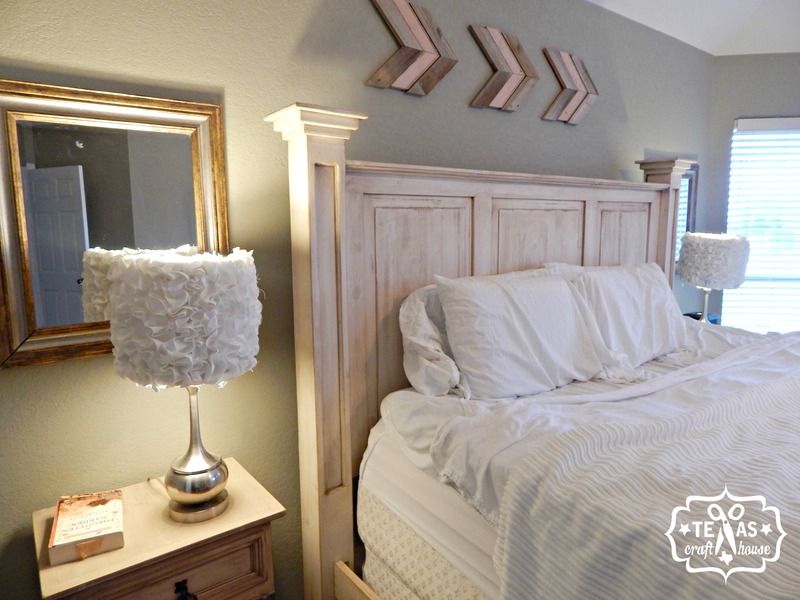 Lamps and lamp shades can have quite the price tag. 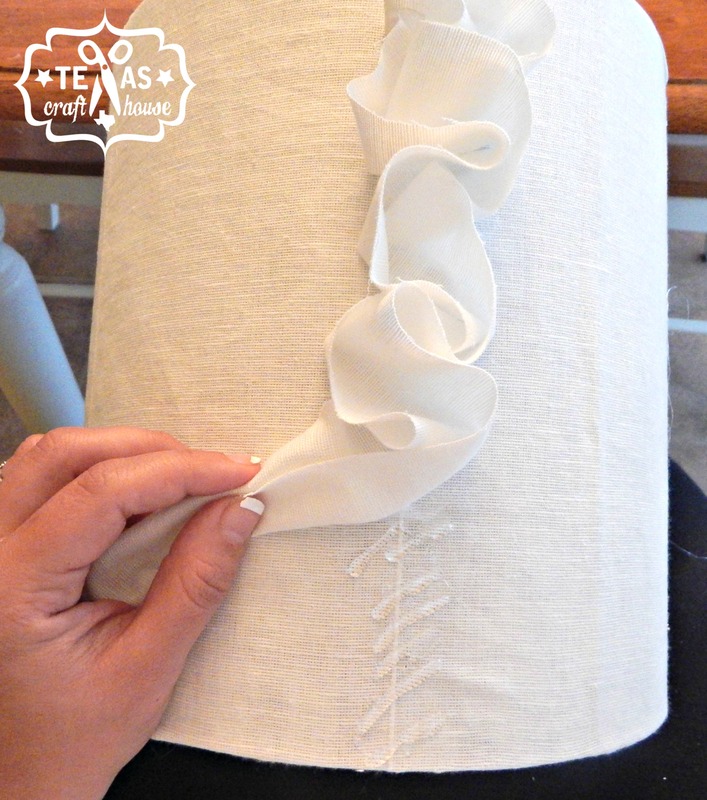 Fortunately I was able to give them a fresh new look with some fabric I already had in my craft room. 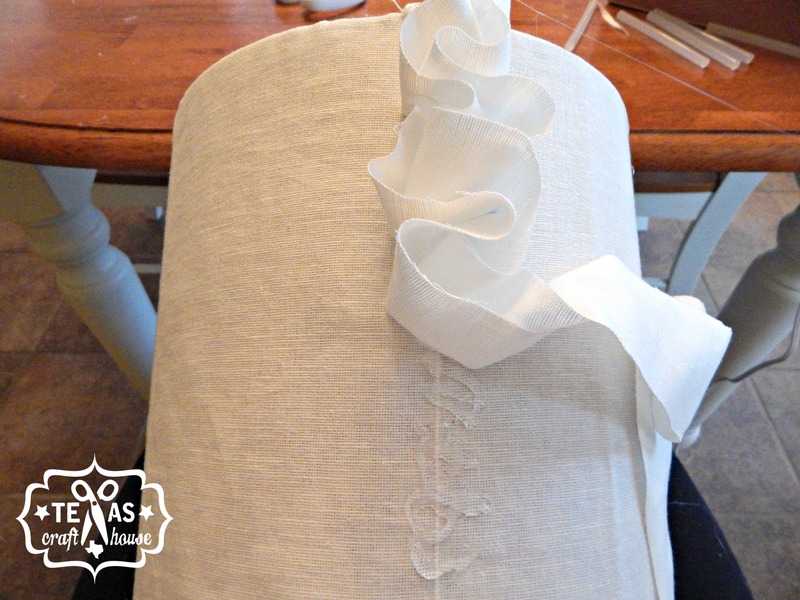 The fabric I used was an ivory linen… actually it was an extra curtain I had from when I put up the curtains in my living room. Remember when I used the metal conduit from Home Depot instead of a curtain rod? I only needed 5 curtains but that package came with 6. 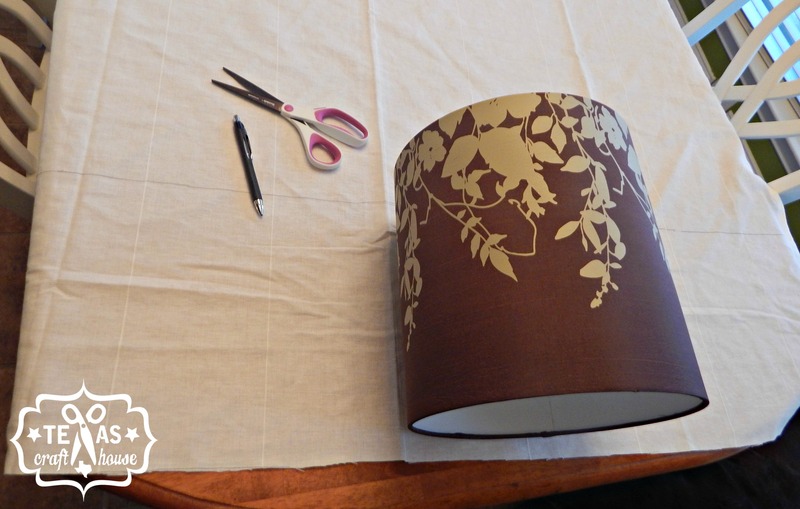 Simply lay out your fabric and measure about an inch above and below your lamp shade, mark with a pen and cut. 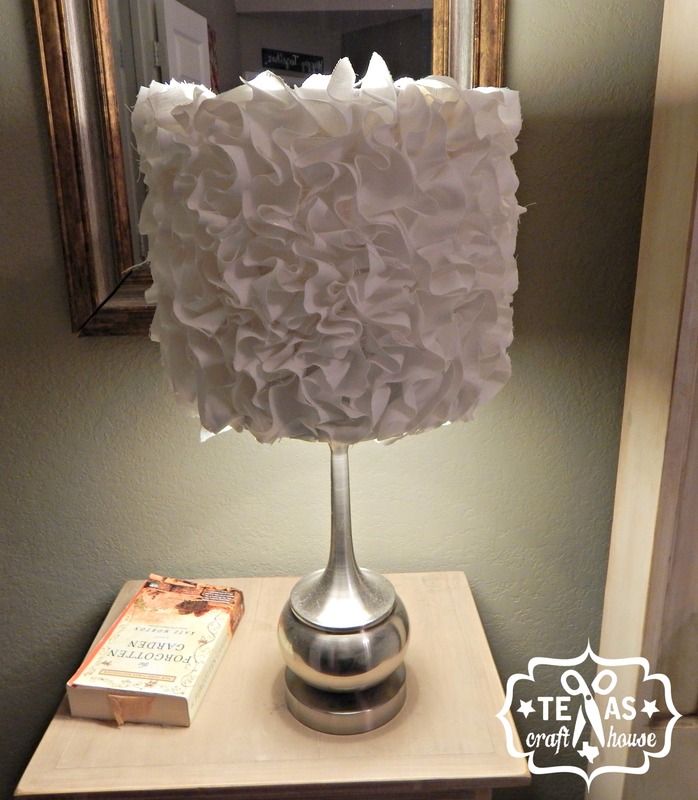 This piece will go around your lamp shade as the new cover. 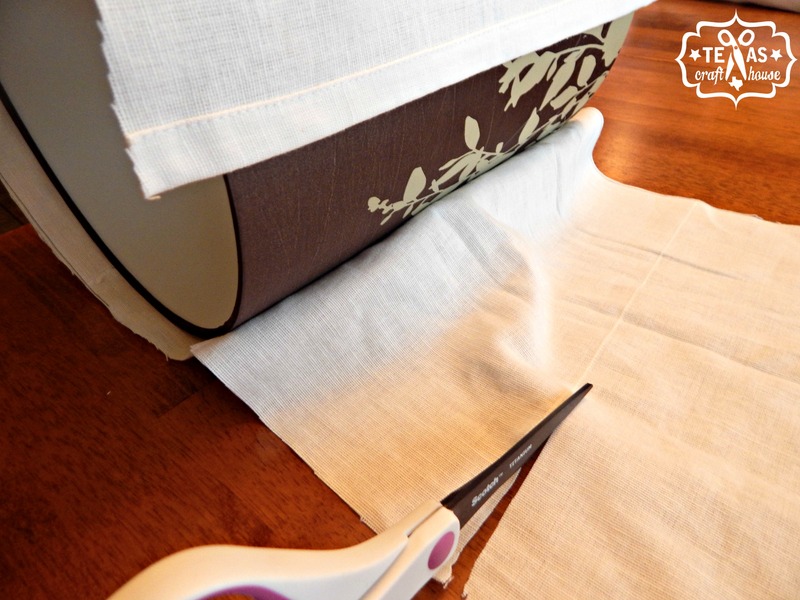 Once cut, you’ll apply the fabric to the lamp shade using the hot glue gun. 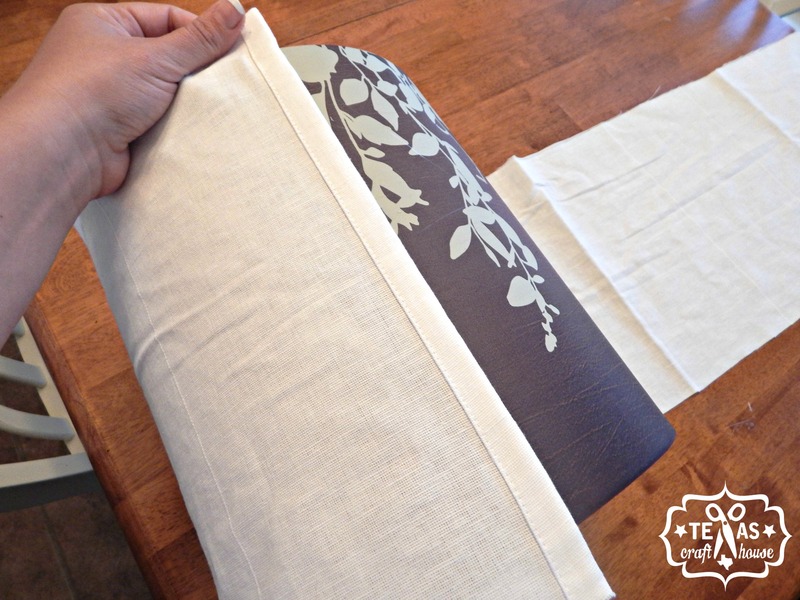 Then roll the lamp shade on the fabric and glue along the way. 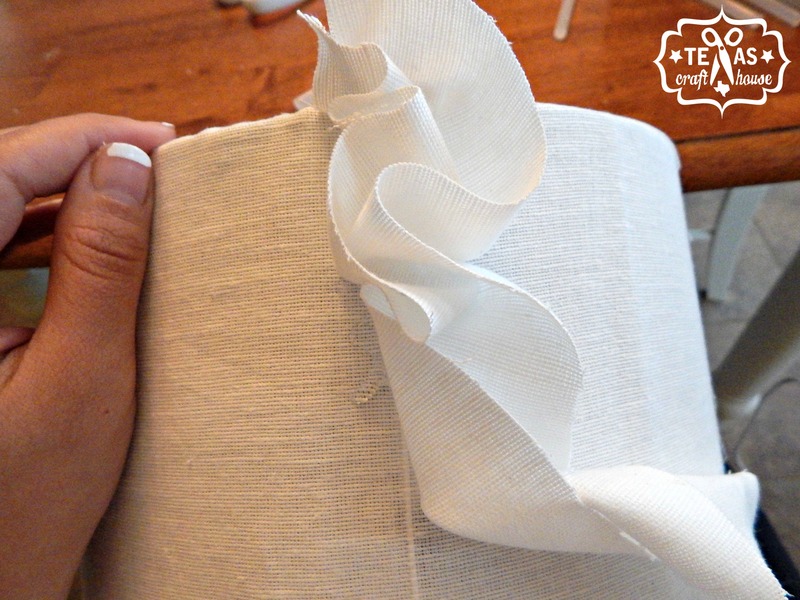 …and glue it to the lamp shade. 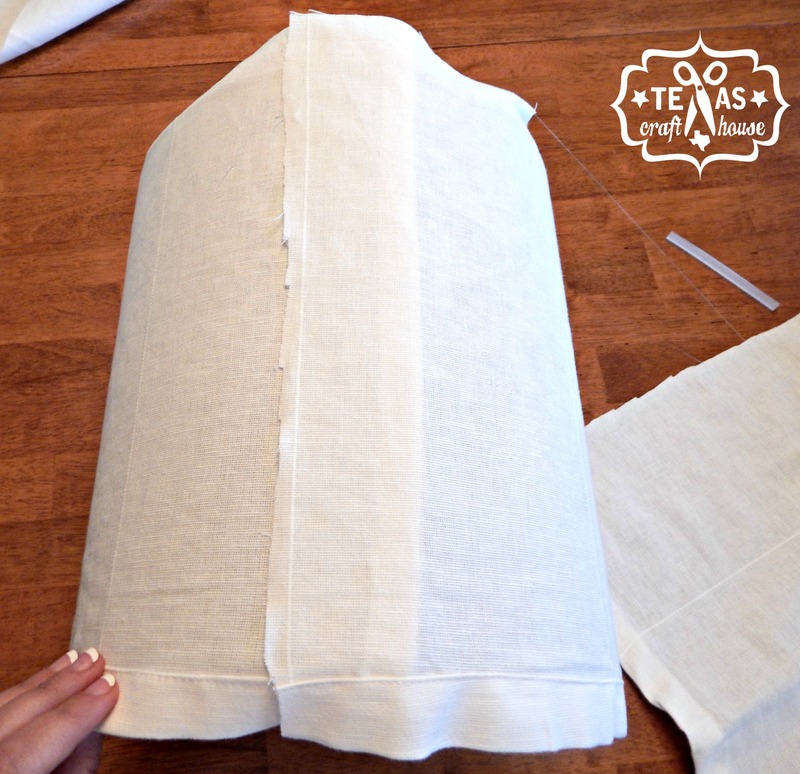 Then fold the bottom and top hems over and hot glue to the inside of the lamp shade. 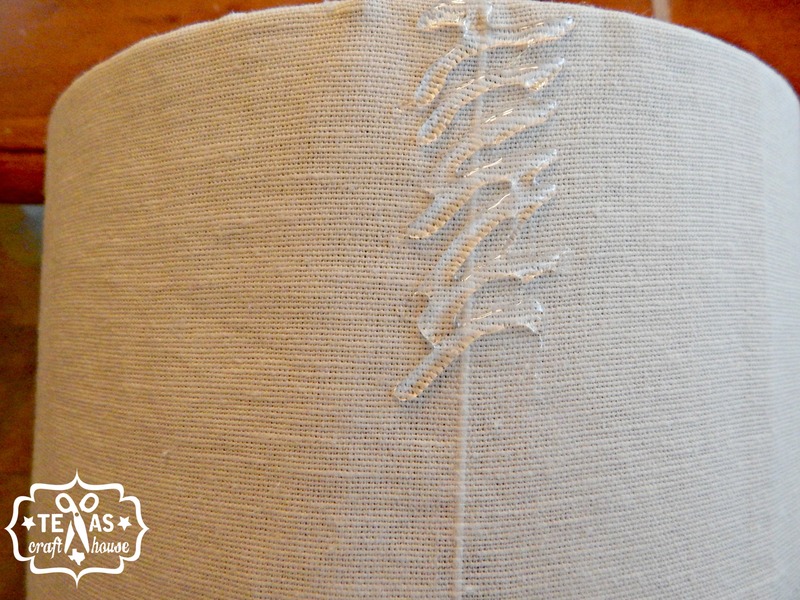 I pulled mine a little tight to make sure the fabric was snug to the lamp shade. 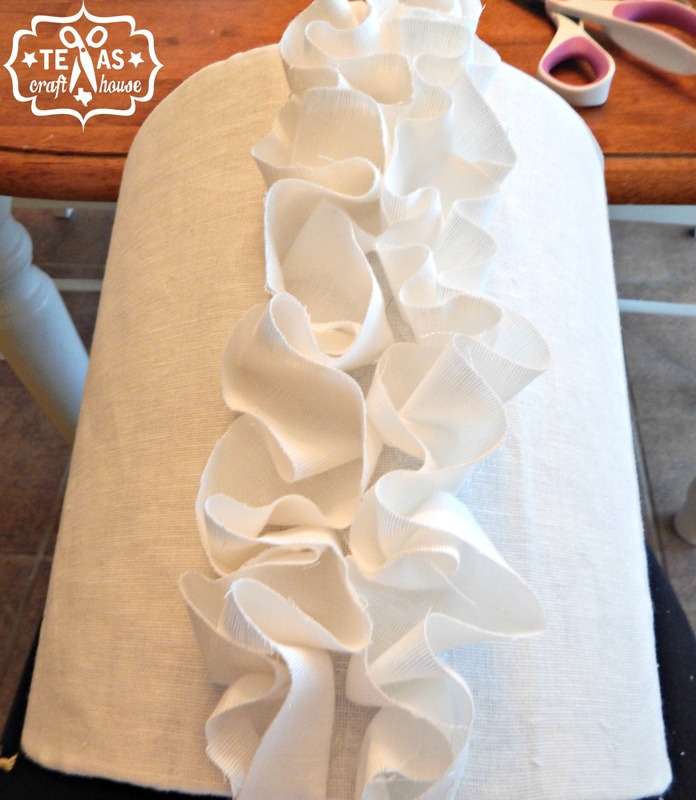 With the extra fabric cut out long rectangular strips. 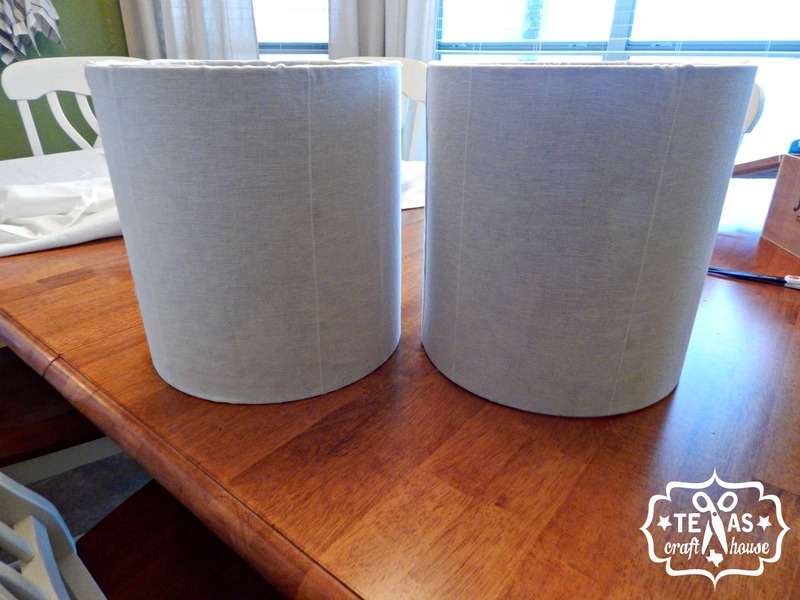 Make them a couple inches longer than the lamp shades. Mine were about 2-3 inches in width. Whatever size you use just try and keep them about the same. If your cut lines aren’t perfectly straight no one will notice. All these strips were for 1 lamp shade and I still had to cut extra. 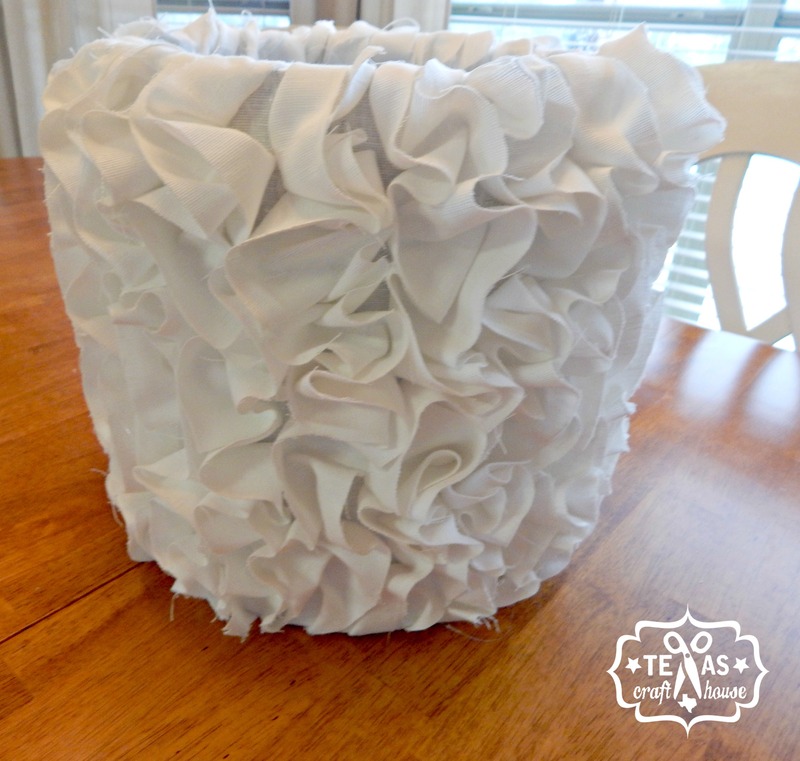 Now prop the lamp shade on your lap and glue a patch of the hot glue. 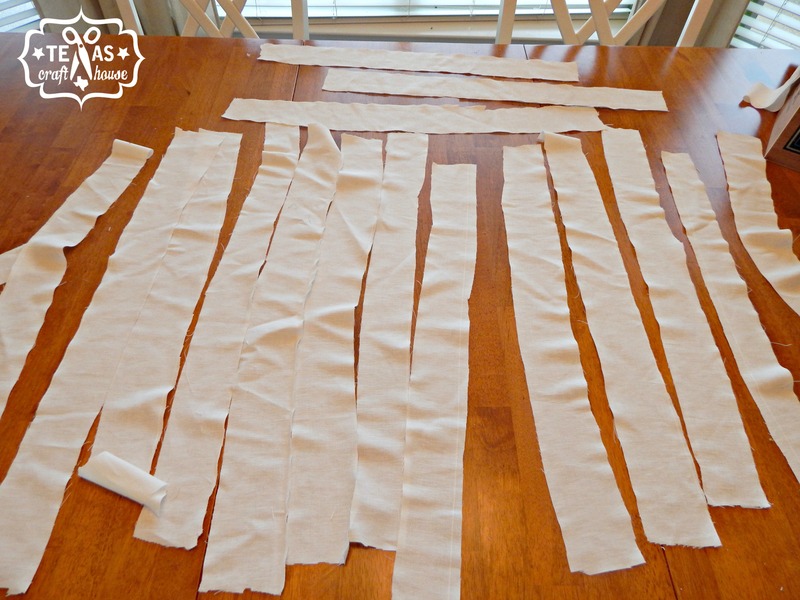 Then take your long fabric strip and fold it in half then place on the hot glue while making little waves, or the letter S.
…down to the bottom. 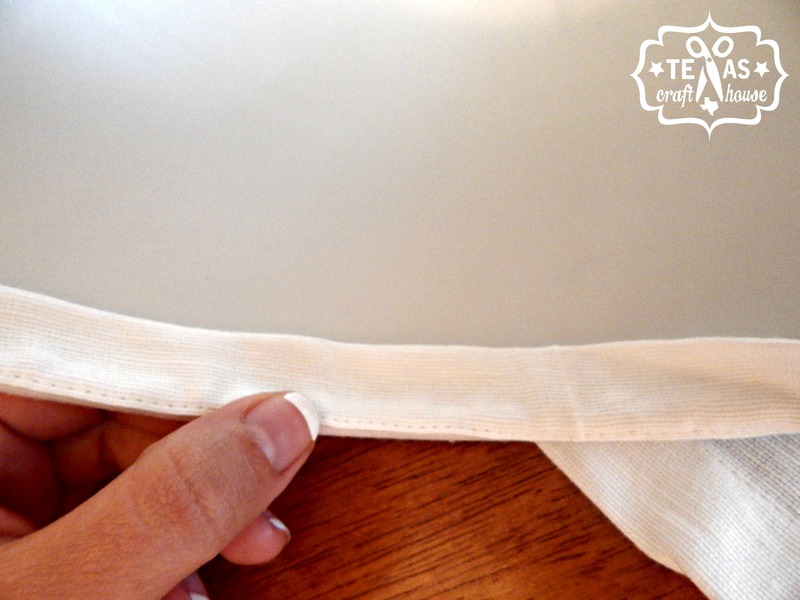 Then pinch the remaining fabric into a triangle and glue to the inside of the lamp shade. 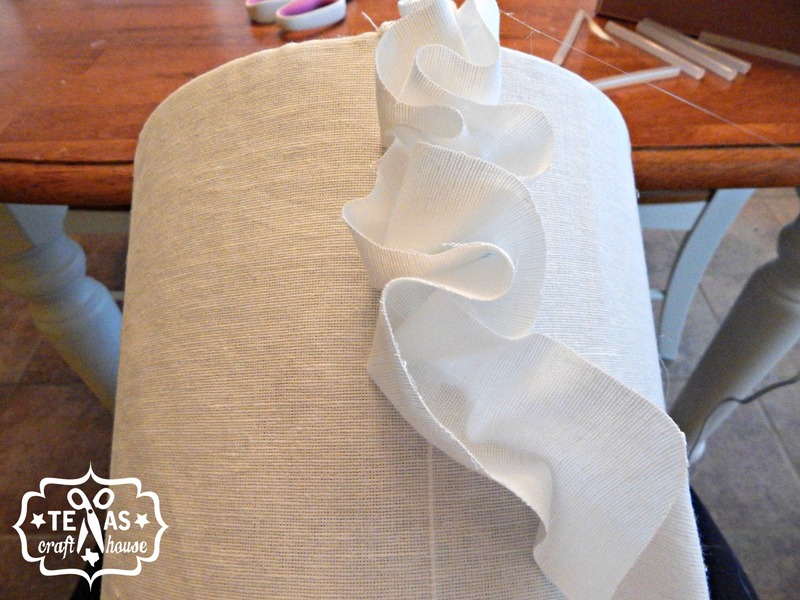 If there is a lot of extra fabric at the end then cut it with the scissors before gluing it all the way down. 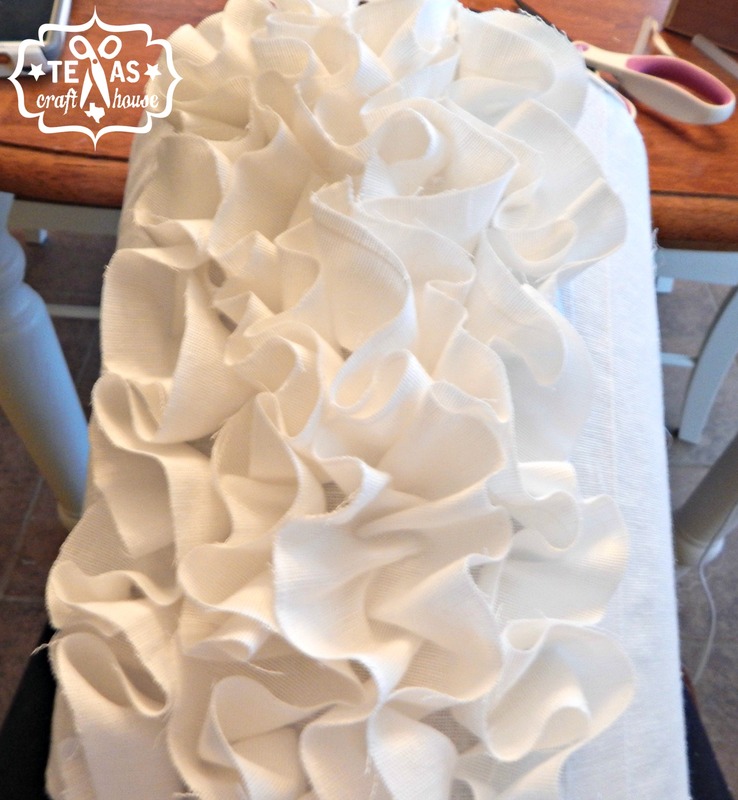 Then start your next row of ruffles! 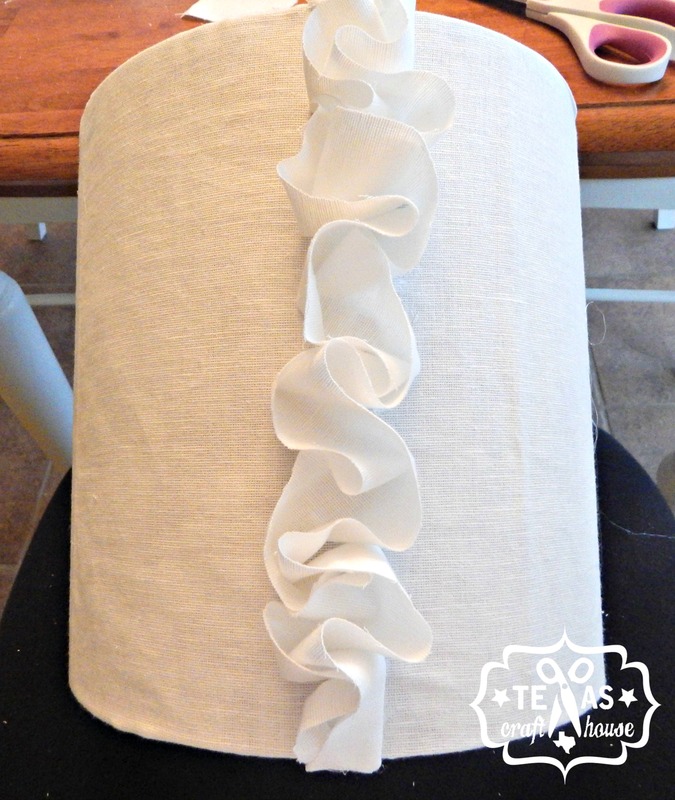 Don’t worry about the ruffles being perfect. The crazier the better. Just make sure your strip is folded in half. 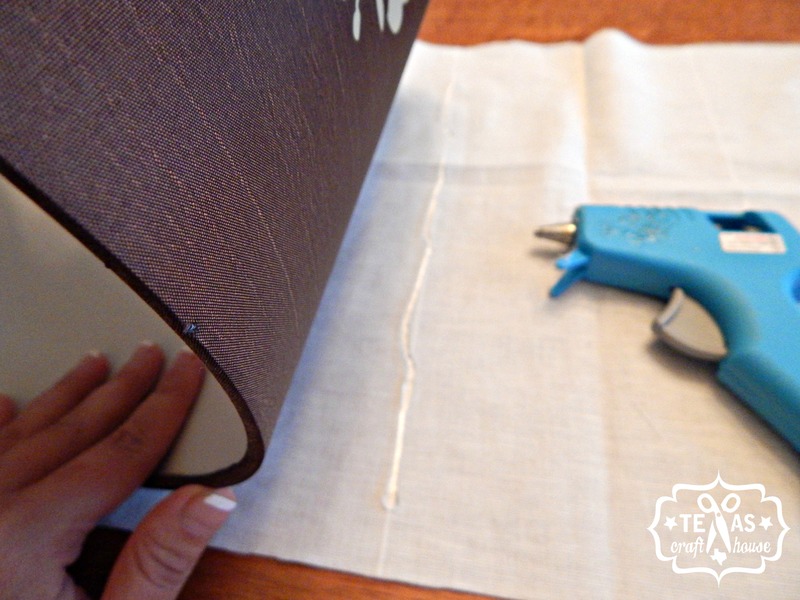 After you glue and are about to place the fabric down I put my index finger inside the fold so that I could mold and place it easier on the lamp shade how I wanted it. This process is very easy but it does take some time. Great time to catch up with what is on your DVR. I love how it turned out. 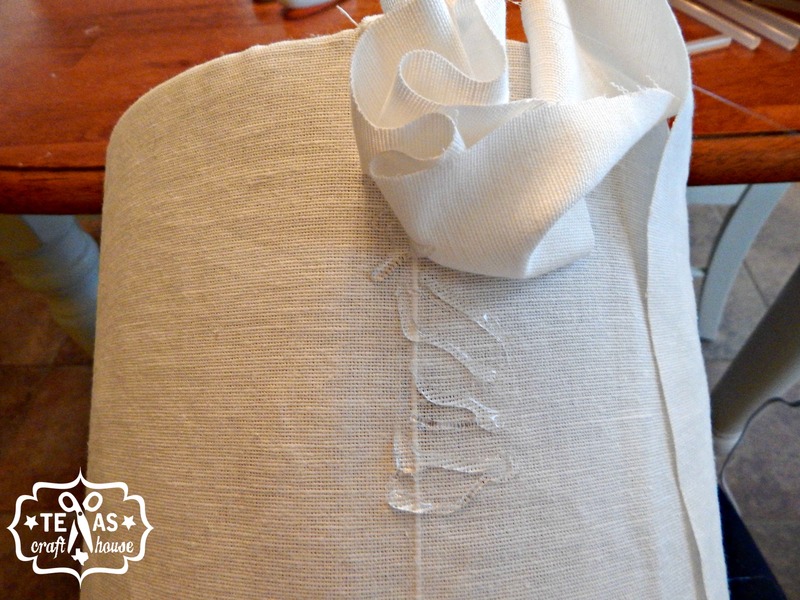 I was so happy that I got to reuse an old curtain for the fabric and reuse the lamp base. This mini makeover literally cost me nothing. I loved how this project turned out. Now to make some no sew throw pillows for the bed. That’s next on my list. Then some curtains and shelves around our TV. So many crafts so little time! 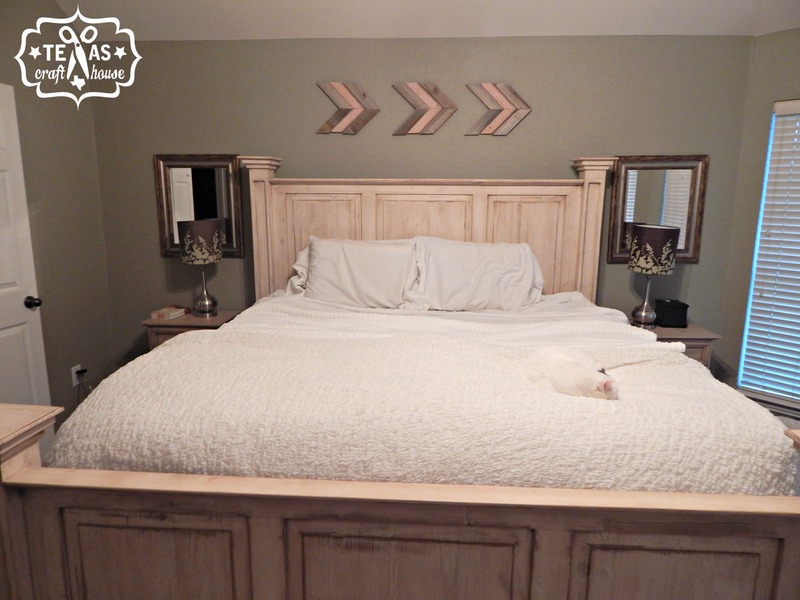 Here’s my little bed model, Sophie… She was there when I took the before pictures and a couple hours later for the after pics. 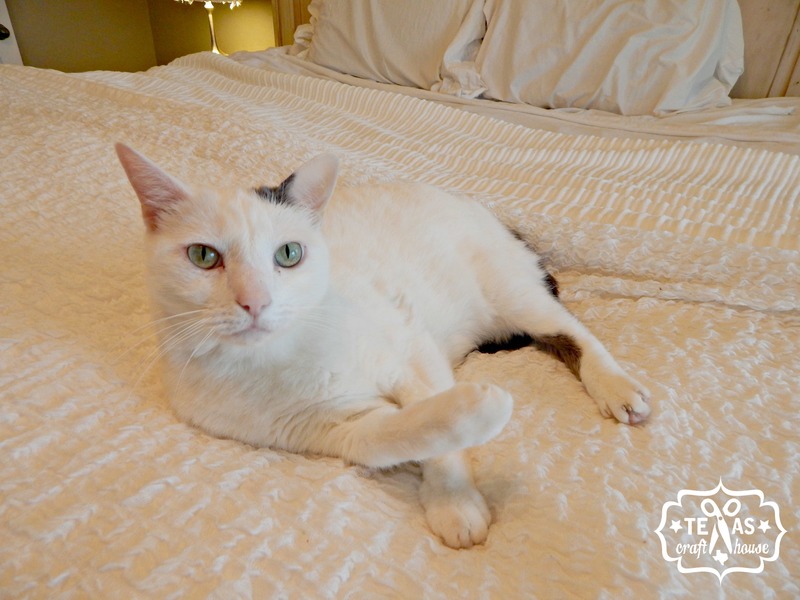 A cat’s life is so rough! 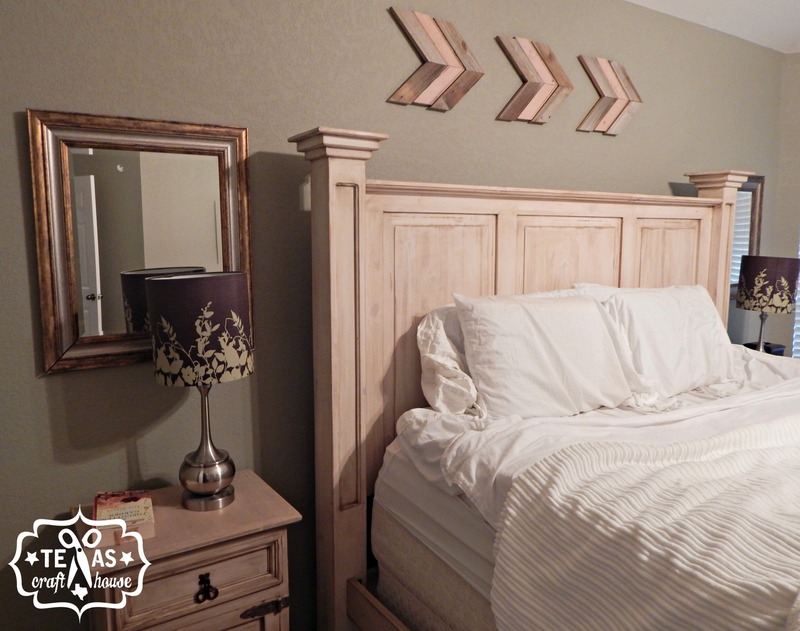 What simple home makeovers have you recently done? OH EM GEE! How cute! 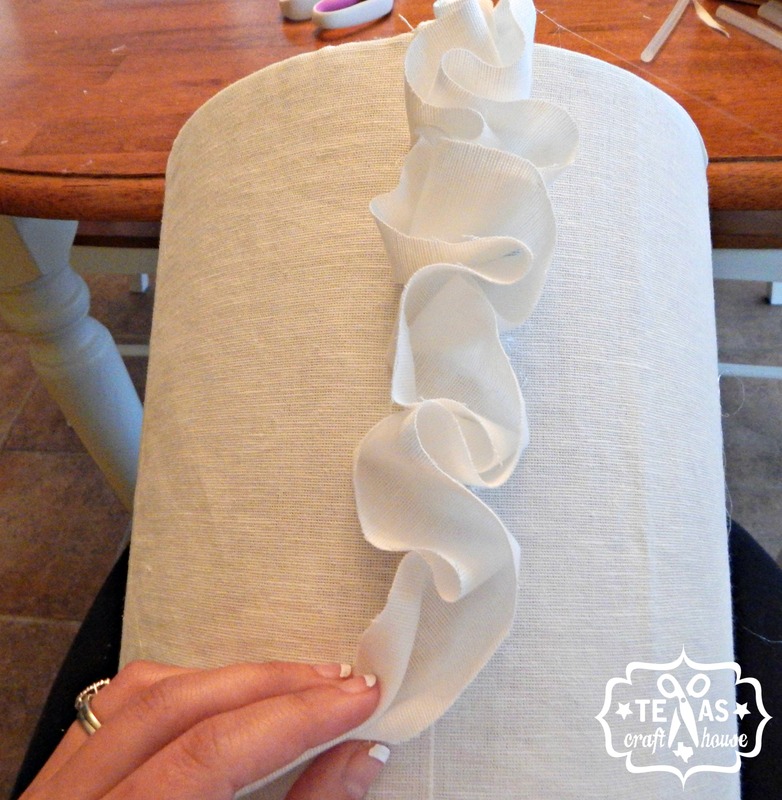 And I LOVE how you up-cycled your curtain! Very, very inspiring!